Welcome to Tarleton Tip Thursdays, where every week we help you harness the power of social media. This week, in preparation for upcoming finals,we'd like to provide some helpful study tips, including how not to let social media distract you when studying for final exams. Tip #1: Use social media platforms, such as Google Docs, to study review material with classmates. Tip #2: Make a checklist or calendar and plan your study strategy. You can use Google Calendar to plan study time with classmates. Tip #3: Enlist study buddies. 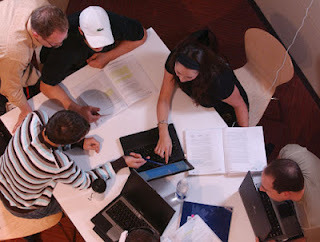 Group study sessions can be conducted on campus (study rooms available in the library) or online using platforms such as Google Hangouts or Skype. Tip #4: Use campus resources such as the writing lab, tutoring services, or counseling services to deal with the stress. Tip #5: Take care of yourself and make time to move! Try to eat healthfully by avoiding fast foods and caffeine, and take short breaks by going for a quick walk. This helps keep you alert and helps to retain more information. Hopefully these tips will help you prepare for your upcoming finals. Just remember, your social networking friends will be there when you are done studying. You can “unplug” for a few days to ensure you do your best work on your finals. Deana Coan is a Communications Major and an intern with the Social Media Committee of the Texas Social Media Research Institute at Tarleton State University. You can find her at on Twitter as @DeanaCoan.